In part 1 , we described how noise can permanently damage hearing, and why wind noise around a rider's helmet at road speed is the main culprit. As it happens, there are some other issues with noise exposure that relate to risk management. It's normal to get fatigued riding a motorcycle for hours at a stretch, but noise contributes to fatigue. When you spend long hours in the saddle exposed to loud noise, you get even more fatigued. That's especially an issue for those of us who ride aggressively, since riding at higher speeds demands intense focus and quicker reactions, even as the higher wind speeds generate louder noise. Fatigue is not just a matter of muscles getting tired, but the brain failing to keep track of the important stuff that's happening around you. Imagine a long ride where you find yourself entering congested city traffic during the evening rush hour. If you're fatigued, you're much more likely to make a mistake that leads to a nasty crash. Noise exposure also leads to your reactions slowing. Let's say that you have really good responses, and at the start of the ride your reaction time is a very quick 0.5 second. In other words, if a driver makes a quick left turn across your path, you'll be able to take evasive action in just a half second. But after several hours of exposure to loud noise, your reaction time will typically be twice as long. So when some driver suddenly swerves into a collision course, you might cruise along for a full second before you take action. Those of us over 55 will typically have reaction times slower than 0.75 second, and our "fatigued" reaction time will be 1.5 seconds or longer. If it's not obvious, the combination of fatigue and slow reaction time can get you seriously killed and permanently dead, whether the hazard is a left-turning car or a delayed-apex corner you didn't expect. The solution to wind noise is simple: wear ear plugs. There are different types of ear plugs, including custom molded, re-usable shaped, and disposable foam. The different types can all have good noise reduction ("attenuation"). The easiest to slip into your ear canals (and the most expensive) are custom molded. A technician will take a mold of both ear canals, and have custom plugs made to fit. The left and right plugs will typically be slightly different shape, but each will slip into your ear canal with little effort�if you don't mix them up. Often, there will be ear plug vendors at rallies and you can get a pair custom molded within a few hours. The downside of custom molded plugs is the expense�somewhere between $75 and $150 per pair. For me, it's not so much the initial expense, but that I tend to lose things. It would be just my luck to drop one of my custom molded plugs while pulling off my helmet, and not notice it's missing until I need it tomorrow morning. 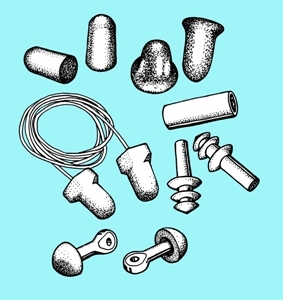 There are re-usable shaped plugs with various sealing lip designs. What makes them re-usable is that the surface is smooth, so you can wash them. The downside of shaped plugs is that some people find the sealing lips to be uncomfortable, and they are somewhat more expensive than disposable foam plugs. My personal preference is for disposable ("throwaway") foam plugs with a bullet shape, and made of what's called "low pressure" foam. Low pressure foam is very soft, and slowly expands just enough to make contact with the ear canals. Disposable plugs are cheap and comfortable. And if I lose one, it's a non issue. The downside is that you can't reuse foam plugs too many times, so you need to carry several pairs to get you through a trip. I've found that I can re-use a pair of "throwaway" plugs for two or maybe three days before I pitch them. Foam plugs require you to shape them before insertion. After a couple of days of use the foam loses its ability to stay compressed, which is the main reason to toss them. Ear plugs are rated for their ability to reduce ("attenuate") noise level. When I'm buying plugs, I wouldn't consider anything with a NRR of less than 30. As far as I know, the attenuation is across a wide spectrum of frequencies, so industrial type earplugs made for the factory or flight line should be fine for wind noise attenuation. 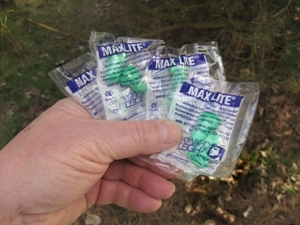 You'll find earplugs for sale at motorcycle dealerships, gun shops, hardware stores, and outdoor equipment suppliers. If you're not sure what type of ear plug you'll find most comfortable, buy several samples, try them out, and figure out what type you prefer. My personal preference is for the "low pressure" throwaway foam, bullet shaped, uncorded, like the Howard Leights, which come packaged in pairs in little plastic bags and are available in sets of ten from the Sound RIDER! online store . 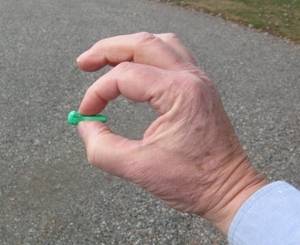 The trick to inserting a disposable foam plug is to gradually roll the plug between your fingers until it's a small cylinder. Rolling it gradually tighter avoids trapping creases that you would feel while wearing. I suggest you wash your hands before rolling a plug, to keep them cleaner. The low pressure foam has some "mystery" chemistry that allows it to expand very slowly�say 10 seconds. That gives you time to get it inserted. 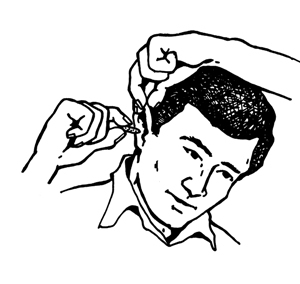 When inserting an ear plug, it helps to grab the top of the ear (the "Pinna") with the opposite hand and pull up, to straighten your ear canal. If you've never worn plugs before, expect some difficulty getting them inserted, and then a bit of disorientation as your brain gets used to the feel and the reduced noise levels. You may be amazed to hear sounds such as your boot heels hitting the ground as you walk. It's always been there, but you can hear it because the masking noises are attenuated. You'll probably have to look down at the tach to determine your engine RPMs, but you'll feel the vibrations better without all the noise. After a few times wearing plugs, you'll also be amazed at how loud the wind noise is if you forget to stuff the plugs in. Oh yeh, are those rugrats in the next booth making too much noise during your coffee stop? Smile as you slip your earplugs back in. Ahhh. David Hough is a long-time motorcyclist and journalist. His work has appeared in numerous motorcycle publications, but he is best known for the monthly skills series " Proficient Motorcycling " in Motorcycle Consumer News, which has been honored by special awards from the Motorcycle Safety Foundation. Selected columns were edited into two books Proficient Motorcycling and More Proficient Motorcycling , both published by Bowtie Press. He is also the author of Driving A Sidecar Outfit and a pocket riding skills handbook,Street Strategies .